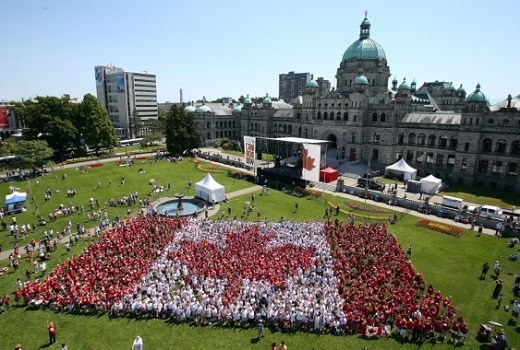 I've mentioned that they didn't tell us, but if the RCMP had announced the foiled terror plot for Victoria in advance, my first choice of activities on Canada Day would not have been to gather with 3000 people in one tight spot on the Legislature lawn. Talk about making it easy for the terrorists. However since we didn't know, we decided to join our fellow Canadians at the parliament buildings on Canada Day to form a Living Flag. At the appointed time they had everybody file in to a pre-marked area on the Legislature lawn according to what color you were wearing. This is the part I was kind of dreading as it was crazy hot out and I thought being packed in tight with a bunch of other people was going to be unbearable. Turns out, you don't have to pack in all that tight at all. In fact you probably had more personal space in the flag than you did standing in line to be let in. ...and sure enough when the pictures were published the next day, the flag actually looked pretty good.